Neuerdings ist (abwählbar) die Yahoo!-Toolbar enthalten ... und es werden auch Portable-Versionen zur Verfügung gestellt. Zuletzt geändert von Jean am 28.09.09, 15:56, insgesamt 28-mal geändert. Funktioniert im Moment nur mit der installierten Version des CCleaner! Alternativ kann man auch die WinApp2.ini direkt herunterladen und in das CCleaner-Verzeichnis kopieren. Dann klappt's auch mit der Nachbarin ääh der portablen Version. Ich nutze mittlerweile eigentlich so gut es geht nur noch portable Versionen diverser Reinigungs-/Wartungstools. Habe ich immer in aktuellster Version auf meinem Stick, wenn ich irgendwo mal wieder eine lahme Kiste auf Vordermann bringen soll. Schon was Neues bei dem Adoptionsvorgang? 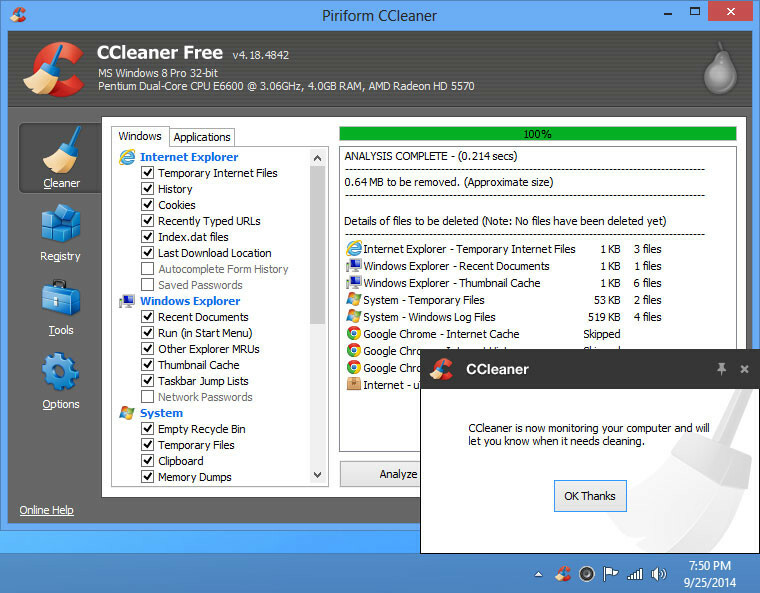 CCleaner v4.18 enables you to set up automatic monitoring and cleaning for Internet browsers and your PC in general. For example, every time you close an Internet browser, CCleaner can perform an automatic clean of browser files and settings, or it can ask you if you want to run a clean. Similarly, CCleaner can monitor your PC and, every so often, detect whether it will benefit from a clean and either clean it automatically, or ask you if you want to run a clean. When you enable automatic monitoring, CCleaner will continue to run in the background and you’ll see an icon in the system tray. Do not close this icon or you will disable automatic monitoring and cleaning. Added Ashampoo Burning Studio 14, XnView and FastStone Capture cleaning. v4.18.4844 is out- the same changelog, mostly a bugfix version for the Active System Monitoring function. "adds a brand new Disk Analyzer tool! You can now see the types of files taking up the most space on your drives, so you can identify areas that need a clean up"
v. 5.03 In this release we've continued to improve compatibility with Windows 10 Technical Preview, along with better Google Chrome session cleaning and the addition of IndexedDB cleaning.